For serious audio nuts, die-hard tweakers and DIYers, some "tool" is strongly needed. Even an elementary one, that could help our ears to listen better. For example, many friends have NO idea of how LOUD is a 100 dB sound or how low is a 40 Hz tone. I've heard stories of audiophiles who swear to shake their floor at insane listening levels with a diminutive 1,5 watts SET amplifier hooked up to a 87 dB/w/m sensitivity loudspeaker. Others swear they fight their worst enemies in the neighbourhood with bass frequencies as low as 30 Hz with a tiny 3 liters enclosure loudspeakers. These stories (sad, but true stories, trust me) always drove me crazy and made me wonder if was there a way to make these guys understand which is the REAL thing. Keep reading. Hi-precision measurement instruments are utterly expensive, insanely huge and damn hard to find. Besides, they are completely too much of a good thing for any common audiophile's purpose. 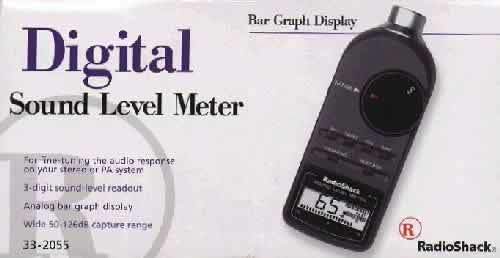 Enter the RadioShack digital Sound Pressure Level (SPL, for short) Meter: a handy, portable, lightweight, easy to use and affordable (at 60 bucks) measuring instrument that can help you debunking many of the myths you may have heard by your friends. When you (or they) say: I play my system really loud... you (they) should know what this exactly means. The SPL meter will tell you the whole truth. When you think your speakers deliver really deep bass frequencies....hook up the SPL meter and play a test disc...and you'll be able to tell the hype from the real stuff. It measures the integrated averaging (over a period of time) and holds the max peak. It can be easily attached to a tripod for easier "standing" measurements. Distortion: Less than 2% at 1 kHz. After all this mumbo-jumbo, I hope you survived. Actually, it is not necessary to understand the numbers above to use the SPL meter. All you need to know is that the dB is the unit for sound pressure measuring (as the watt is for electric power) and that the A-weighting takes into account the typical human ear response, reducing the frequency response of the SPL meter to the 500 - 10,000 Hz range, where our ears are mostly sensitive, while the C-weighting measures the whole range from 32 to 10,000 Hz. For HiFi-measuring purposes, I'd suggest to use the wider C-weighting set up. Point and shoot: that's all. Seriously, choose the operative range, the weighting (C, recommended), set the peak-hold function and fast response of the display, point the SPL meter to the stereo system, exactly (or near) where your ears are when you are sitting in your fav listening position. This will give you an idea of the REAL sound pressure you're used to. Chances are it'll be between 60 and 100 dB. Now, 100 dB's, at your listening seat, produce a very high sound pressure, especially if this is mainly "continuous". Consider I listen quite far from the speakers, so sound pressure at 1 meter from the drivers is way higher. This means I need high sensitivity speakers and/or powerful amplifiers. Of course, this happens with pop/rock. When listening to acoustic or classical Music I set the listening level to a more REALISTIC threshold, like I was in a concert hall or jazz club. So the advice should always be: adjust your listening level according to the musical genre you're listening to. HiFi has to be REALISTIC, that's why I listen to rock at 110 db :-) Ever been to a rock live concert? This test is good to determine the bass reposnse of your room/system, for example. Set a reasonable volume, then read what the SPL meter says. Chances are the digits will start to go down with the frequency on the disc: this happens because most loudspeakers can't have a flat reponse till 20 Hz...and their output will start to drop dramatically under their "so-called" -3 dB point (check out the manufacturer claimed specs for this). Ah, this is a way to determine (grossly) if the claimed specs are for real or just HYPE. Also, with the same disc you can grossly get an idea of your in-room frequency response, determine resonancies, stationary waves and so on. Not a very precise method, but it works. Continuous high pressure levels (> 100 dB) can permanently damage your ears. Always set the volume accordingly when testing. Continuous high pressure levels can permanently damage your loudspeakers, turn down the volume if you hear any distortion. Handle the SPL meter with care, it is sturdy but don't forget it is a precision device. Being an inexpensive meter, its accuracy is just fair (± 2 dB @ 114 dB). Also, a wider frequency response would have been useful for us HiFi-nuts. Anyway, RadioShack offers more sophisticated Sound Level Meters (follow this link to see the various models) but these are more expensive. Conversely, if you're trying to save something, RadioShack even sells an analog, cheaper SPL meter (35 $). Then you can't help but buy a SPL meter. This one or another one, it doesn't really matter. Now, RadioShack offers this easy to find and inexpensive digital Sound Level meter that you can buy at any RadioShack store in the US of A or order it online if you live abroad, this side of the pond (please contact Ann.Kothmann@radioshack.com for international ordering and shipping requirements).